The Berkeley City Council will vote Tuesday on a proposal that would prohibit the city from doing business with any vendor that acts as a data broker or provides "extreme vetting" services to U.S. Immigration and Customs Enforcement, or ICE. "We don’t have direct power over ICE but we do have direct power over where do we invest the city’s money and who do we contract with," said Kriss Worthington, a Berkeley councilman who is sponsoring the measure along with councilmembers Cheryl Davila and Kate Harrison. "It's the same thing that any consumer, when they go shopping, can [do to] send a message to corporations about which products they're willing to buy and which products they're willing to boycott," he added. Berkeley's Sanctuary Contracting Ordinance is modeled after one that was passed by the Richmond City Council in May of this year. In addition to Berkeley, the city councils of Alameda and Oakland are also considering similar proposals to forbid working with firms that provide data or personal information that could be used by ICE to target undocumented immigrants. The Berkeley ordinance defines extreme vetting as "data mining, threat modeling, predictive risk analysis or other similar services." A data broker collects and resells personal information to third parties -- including government agencies -- such as a consumer's credit history, court records, driver's license and vehicle registration information. The Berkeley city council would be able to grant a waiver to a company if no “reasonable alternative” exists for the services provided by it. In November 2016, after Donald J. Trump was elected President, Berkeley reaffirmed its status as a sanctuary city, and has since passed resolutions that restrict the use of city funds and resources to help enforce federal immigration laws. In March 2017, Berkeley made national headlines when its city council voted to divest city funds from any company involved in the construction of a new wall along the U.S.-Mexico border. "In every California sanctuary city proclamation that we’ve seen, it’s been by resolution, and a resolution is just a mission statement, it’s unenforceable," said Brian Hofer, chairman of the Oakland Privacy Commission and a member of Deport ICE, a coalition that has been lobbying cities in California to adopt ordinances to stop doing businesses with firms whose services help ICE identify or detain undocumented immigrants. 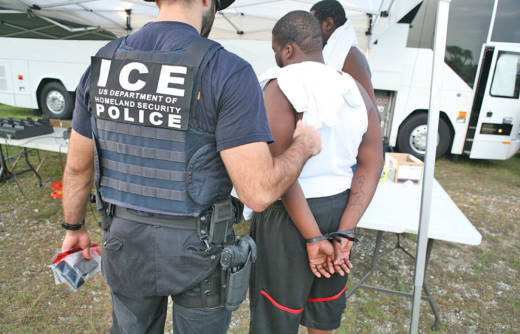 "It's going to start impacting these companies’ bottom lines and profits as they start to become ineligible for contracts... and that’s ultimately our goal, that they just stop working with ICE," said Hofer. Deport ICE was one of more than two dozen organizations that sent a letter on Monday to Berkeley Mayor Jesse Arreguin and the eight Berkeley City council members. The letter pointed to actions taken by the cities of Alameda, Culver City and San Pablo earlier this year to either reject or postpone contracts worth more than three million dollars with Vigilant Solutions, a Livermore-based company that provides license plate recognition, facial recognition and other data analytics to law enforcement agencies. Responding by email, Mary Alice Johnson, a spokeswoman for Vigilant said, “Vigilant Solutions does not share any law enforcement data.” She added that the company “is not at liberty to discuss or share any contractual details,” in response to a question about whether Vigilant’s business has been impacted by cities taking a closer look at awarding contracts to companies that may do work for ICE. The Berkeley City Manager's office has not yet evaluated what impact the proposal would have on existing city contracts. An ICE representative did not immediately respond to a request for comment.